This month in our Four Questions artist interview series, we catch up with Los Angeles based sports and lifestyle photographer Erik Isakson. Reading List: The E-Myth , Steve Jobs Biography , Unbroken . Follow on: Website, Tumblr, Vimeo, LinkedIn, G+, Instagram. What came first, love of sport or love of photography? How does that first love affect your work/style today? I would have to say my love for sports came first. I was involved with soccer, baseball, basketball and football as a kid and into high school. One of my early memories of really getting excited about photography was going over to my best friends house and scrolling through slides on the projector, looking at all the exotic places my friends dad had traveled to. It was really inspiring to me to see all the interesting places and people he had photographed and I wanted to experience that too. I would have to say that my real focus on sports lifestyle imagery didn't really take hold until my senior year at BYU when I was contemplating what to do for my senior BFA show. Since the Olympics were to be held in a couple years in Salt Lake City, it seemed to be the perfect fit to do a show focused on portraits of various summer and winter Olympic athletes. From there my love for photographing athletes really developed. What are some of the differences and similarities in working with high profile vs low profile professional athletes? Child athletes? One of the biggest obvious differences is the time allotted for a photo shoot. For example, a few years back I photographed NBA superstar, Kevin Garnett. It was a magazine cover shoot for Sports Illustrated Kids magazine and I knew we had one shot to nail it. We had one lighting set up in the hallway of the arena and an additional lighting set up on the court. We literally had 10 minutes with him at each set up and the shoot was over in 20 min. Quickly connecting and directing the high profile athletes is important. A couple years back I photographed Blake Griffin for a cover shoot for DIME Magazine and this was before he was a superstar. He gave me at least an hour for the shoot and at the end he was very gracious to sign a basketball I had brought to the shoot. After he signed it he said, "I'm not sure my signature is very legible on this ball, let me go over it again so you can see it better". I was laughing inside thinking "Gosh, this guy is about to become a millionaire. This will be the last time he'll care about how his autograph looks on a ball!" I have a lot of fun photographing kids doing sports. They're easy to direct and willing to try anything. Please discuss the difficulties associated with your chosen style. Special equipment needed for projects, environment hazards potentially damaging to equipment, ie water series? Speaking of, your recent water series was in development for many years, how has technology affected your ability to move forward on this project? How do different projects affect the type of equipment you will use? The water series, like many of the shoots I come with, was kicking around in my mind for almost a year. 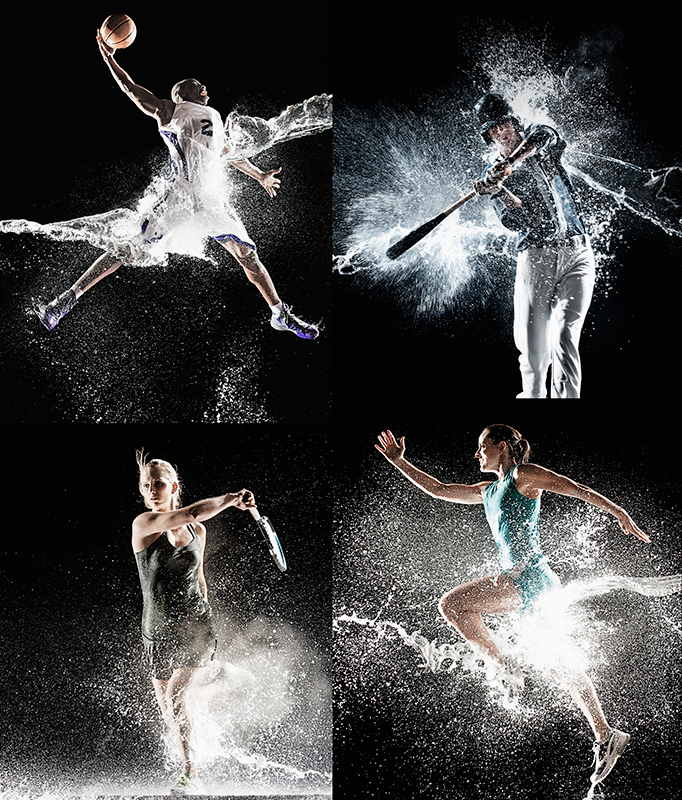 There were so many elements that went into making it work, such as the time of year I'd shoot it, the temperature, time of day, background, finding a location with warm water, finding athletes who could do the various poses I had in mind, renting the proper lighting gear, timing the splash with the poses etc etc. For that shoot I rented the amazing Profoto 8A packs which offer a very short flash duration and ultra fast recycle time, both very important for capturing the moment of motion and splash I was looking for. I took one day to photograph some local teenagers, to test out my ideas. The second day of shooting I photographed more accomplished adult athletes. Ironically, several of my very favorite shots were from the first night of the 16 year old baseball player. I also shoot with a Nikon D4 which has a very fast motor drive and nails difficult focusing situations every time. When I graduated from BYU with a BFA, I owned a Nikon F100 and Mamiya RZ67. The Mamiya was my primary camera. I would get 10 frames per roll and manually focus and hand crank the film advance. Every shot was much more thought out, metered and carefully executed, knowing how much it was costing me. Now I still use many of those principles I learned while working with film cameras, I'm just able to work much more quickly and efficiently. Has technology had any negative impacts on the photography industry in your eyes? I recently attended Photo LA, a big annual photo gallery exhibit in Santa Monica. I saw a framed print taken of Ansel Adams in Yosemite by his then assistant Ted Orland. I just had to buy it. Its a shot looking through the trees at Ansel changing the settings on his 4x5 camera as he prepares to take a picture. I now have it hanging on my office wall. It reminds me everyday to slow down and think about what I'm doing and not rushing the process. I think its important to remember this while taking pictures and running a business.